The Drum and Bell towers are situated at the northern end of the central axis of the Beijing Inner City to the north of Di' anmen Street. The Drum Tower was built in 1272 during the reign of Kublai Khan, at which time it stood at eh very heart of the Yuan capital Dadu. At that time it was known as the Tower of Orderly Administration (Qizhenglou). 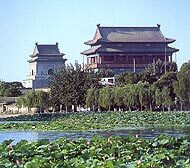 In 1420, under the Ming Emperor Yongle, the building was reconstructed to the east f the original site and in 1800 under the Qing Emperor Jiaqing, large-scale renovations were carried out. In 1924, the name of the building was changed to the Tower of Realizing Shamefulness (Mingchilou) and objects related tot eh Eight-Power Allied Forces' invasion of Beijing and later the May 30th Massacre of 1925 were put on display. Nowadays, the upper story of the building serves as the People's Cultural Hall of the East City District. The first level of the Drum Tower is a solid square terrace four meters high, 55.6 meters long and 30 meters wide. The front and rear of the terrace are pierced with three arched openings and the two sides with one opening each. The broad, squat multi-eaved wooden structure built atop the terrace is impressive with its red wall and yellow glazed roof. In ancient days, the Drum Tower was the time keeping center for the whole city and was equipped with bronze clepsydras (water clocks) and drums that were beaten to mark the hours. The four bronze clepsydras, which once functioned in the Drum Tower, were reputed to date from the Song Dynasty. Set between these four devices was a large bronze gong, which through a series of mechanical devices was linked to the water clocks and sounded each quarter of an hour. When the system of telling time with incense coils, which burned for hours were introduced, the clepsydras fell into disuse. In ancient times the upper story of the building housed 24 drums, of which only one survives. Its head is made of an entire ox hide and is 1.5 meters in diameter. A sword score on the side of the drum is a souvenir of the Eight-Power Allied Forces' invasion of Beijing in 1900. In the Qing Dynasty, the hours were marked at night beginning at 7:00 p.m., a procedure that was popularly called "setting the watch." At this hour, the drums were sounded 13 times. After the watch had been "set" in this fashion, each subsequent two-hour interval was marked by a single drum beat. Civil and military officials oriented their lives around these time signals. At the sounding of the third watch (1:00 a.m.) officials attending the morning court audience rose from there beds and at the fourth (3:00 a.m.) assembled outside the Meridian Gate (Wumen). At the sounding of the fifth watch (5:00 a.m.) they entered the Imperial Palace and knelt on the Sea of Flagstones (Haimen) before the Hall of Supreme Harmony (Taihedian) to await instructions from the emperor. Close behind the Drum Tower stands the Bell Tower, a 33-meter-high edifice with gray walls and a green glazed roof. Each face of the base of the building is pierced with an arched opening and each side of the Bell Pavilion, which stands on the platform, has an arched gateway as well. The Bell Tower first came into use during the reign of the Ming Emperor Yongle, which it was converted, from the main hall of the former Temple of Eternal Peace (Wanningsi), which had been built during the Yuan Dynasty. The new Bell Tower was destroyed by fire after only a brief existence and it was not until 1747 that Emperor Qianlong undertook the reconstruction of an attractive durable stone structure. This building was so sturdy that he only damage that it suffered during the Tangshan earthquake of 1976 was the loss of a single stone animal head decorating the roof. The Bell Tower originally housed a huge iron bell. But because its tolling was not loud enough, this was replaced by a massive cast bronze bell over 10 inches thick that is in perfect condition today. The iron bell was moved to the back of the Drum Tower where it has remained for over 500 years. As recently as 1924, the bronze bell could be heard ringing out the 7:00 p.m. chime from a distance of over 20 kilometers. According to legend, an official named Deng tried unsuccessfully for over a year to cast the bell. On the eve of the final casting, his daughter, fearing that further delays and loss of working time would bring blame on her father, decided to sacrifice her life in order to move the gods to bring about a perfect casting, and threw herself into the molten bronze. Her panic-stricken father could only recover a single embroidered slipper from the flames. The casting was a success and the emperor, moved by the young girl's spirit of sacrifice, named her the "Goddess of the Golden Furnace" and built a temple in her honor near the foundry. By the ordinary people she was remembered as the "Goddess Who Cast the Bell." After the bell was installed, the chimes could be heard clearly and resonantly all across the city. But on stormy evenings, the bell would emit a desolate moaning sound similar to the word xie, which means "shoe" in Chinese. Recalling the old legend, mothers would comfort their children with: "Go to sleep! The Bell Tower is tolling. The Goddess Who Cast the Bell wants her embroidered slipper back."